It has its charms, but isn’t particularly memorable. Sir Lionel Frost (Hugh Jackman) is an explorer obsessed with proving the existence of myths and monsters. His peers don’t take him seriously, but with new evidence at hand, he is determined to prove that Bigfoot is real. When Frost meets the creature, he names him Mr. Link (Zach Galifianakis) and makes a promise that he will help the larger-than-life character find his distant relatives, the Yetis, in the Himalayas. They are accompanied by fellow adventurer Adelina Fortnight (Zoe Saldana). 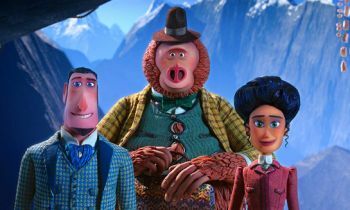 Laika, the stop-motion animation studio behind ‘Missing Link’, has gained a positive reputation for producing highly original, beautifully designed and surprisingly emotional feature films. Audiences should be familiar with at least one if not a few of their titles – ‘Coraline’, ‘ParaNorman’, ‘The Boxtrolls’ and ‘Kubo and the Two Strings’. Interestingly though, ‘Missing Link’s London setting and villains most recall Tim Burton’s ‘Corpse Bride’, on which Laika was a co-producer. Unfortunately, the latest from the studio is probably the least imaginative of their works so far. It has its charms, but isn’t particularly memorable. 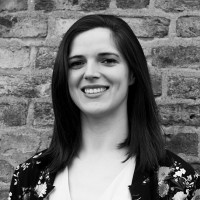 You’ll recognise plenty of the voices that give life to the characters. Aside from Jackman, Saldana, and Galifianakis, the vocals of Stephen Fry, Emma Thompson, Matt Lucas, David Walliams, and Timothy Olyphant also feature. 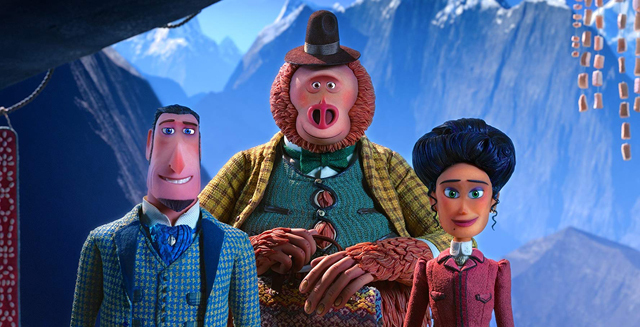 The quirky nature of their characters recall Aardman’s (creator of ‘Wallace & Gromit’) works, while the old-school sense of humour and use of visual gags are also akin to the rival stop-motion animation studio. There are interesting little details honed in on, such as a shoe stepping in water, that fans of animation can geek over. The movie is at its strongest when centred on Link. Some older audiences might find him irritating, but he’s the biggest source of humour and heart for the feature. Voiced by ‘The Hangover’ star Zach Galifianakis (who also did a fantastic job voicing the Joker in ‘The Lego Batman Movie’), Link’s funny moments derive from miscommunication with Frost as he tends to take everything literally. His awkward size also gets his colleagues in quite a few sticky situations. There are some nice action set pieces, such as a ride on the Loch Ness monster, a bar brawl, a safe break-in, and a chase on a ship in the middle of the storm, plus the globetrotting narrative lends itself to some nice backdrops, but one feels like they’ve seen more creativity in other animated features. The villain, even if he is voiced by Stephen Fry, is quite forgettable, as is Adelina, though at least it’s nice to see a female character get a decent ending. There are some smart jokes reflecting on the times thrown in but not a lot sticks. Still, it’s entertaining enough for the running time and it has got a thrilling final confrontation with the baddies.